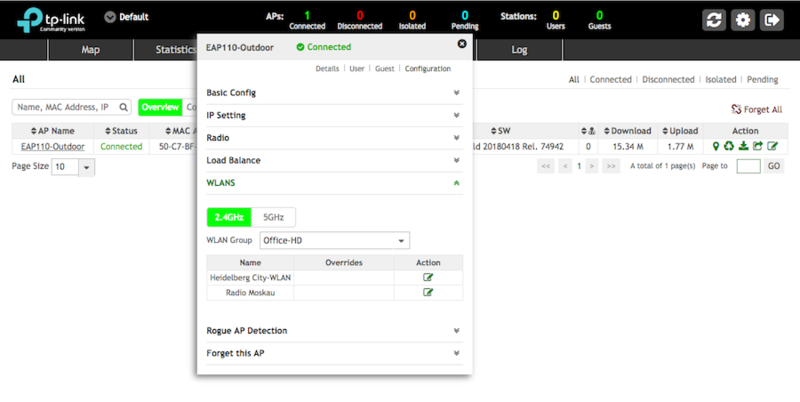 Re:Omada EAP Controller 3.0.2 for Linux is here! How can we make fresh install on esxi (ubuntu 16.04 or 18.01) ? p.s.for newbies instuctions please... tplink not support linux install since 2.5.3 anymore? But I had the 2.5.3 installed. I completly removed that and redo the installation according your guidelines. The file '/opt/jvm/jre1.8.0_181/bin/java' belongs to no guest image and there is no default guest image. I believe I must have done something wrong with the java step but not sure why as I'm (pretty) confident I did what you mentioned to do. any ideas? that's pretty easy, just follow the steps in this recipe showing installation of v2.7.0, but download the new TAR archive v3.0.2 instead. Set up a role account (user »eapc«) first (step 1). Then download the TAR archive from this post here (step 2). Then extract the TAR file, install it in /opt/tplink, install Oracle's Java JRE and the mongodb package (remaining steps in the post linked above). The important point is to first execute the command in step 1 of the recipe linked above in order to get right file ownership if you extract the TAR archive. All other steps can be issued in almost any order then. Exec format error meas that the JRE downloaded is for another CPU architecture. What CPU architecture do you have and what did you download from Oracle? You're welcome. TP-Link Germany always is kept informed by me, they know first-hand if a new Linux port came out. I tested EAP Controller 2.6.1 and 2.7.0 on PC Engines APU1D4, APU2C4 and even ALIX 2d13 already. Runs fine, albeit a bit slow, much like on the Raspberry Pi 3 ARMv7 platform. As for TP-Link's R&D, they already got my tpeap script by mail in June 2017, when EAP Controller v2.4.7 came out. Re:Re:Re:Omada EAP Controller 3.0.2 for Linux is here! It's on Raspberry pi 3. It worked before with older version of the controller for Linux. I guess I broke it with using the wrong version following your guidelines. It's fixed now with setting the alternative values back. [....] Starting Omada EAP Controller:.................................................................[FAIL. failed! Start failed - see '/opt/tplink/EAPController/logs/server.log' for errors. I guess I break it with using now an the incorrect version of Java? I used the one in your guidelines. Is there another one I better use for the Rasberry pi? On the RasPi you don't need to install Java, Raspbian already comes with Java installed (current version 1.8.0_65). Thus, there are even no special steps required on Raspbian compared to us poor Debian users, who got no Java pre-installed. Step 0: Stop mongod and the EAP Controller if it is running (issue the command ps -eaf | grep java to find it, kill it). Step 2: Extract the TAR archive in the home directory of EAP Controller. Important: do this step only after you did create the »eapc« role account, else file ownerships will be wrong! Omada EAP Controller started successfully. Direct your browser to http://raspberrypi:8088 for accessing the Omada EAP Controller. If you don't specify -W 250, tpeap will start the EAP Controller in the background, but you still have to wait for it to become ready. Omada EAP Controller is still initializing, please wait. # How long to wait for completion of the start if '-w' is given (seconds). Pleeeeease don't post Java server.log. It contains Java mess, nothing really useful. Please shorten your posting, I won't read Java stack backtraces at all. But o.k., there is one (1) useful message: You have wrong file permissions/ownerships. See my previous post, check for the correct ownerhip of the files.